On Saturday, from 11 a.m.-1 p.m., I'll be at the 7th Annual Author Extravaganza at Town Crier Bookstore, Emporia, KS, signing copies of my recently published novel, THE POWER CLUB. I won't be alone, of course. Judging by Town Crier's website, about 40 other authors will also be there, including members of my critique group, the legendary Monday Night Writers. Based on the writers I've known and met in the past, genres represented will include fantasy, flash fiction, humor, poetry, science fiction, thriller, children's and Young Adult. Last year, I attended my first Author Extravaganza and it was a blast. The bookstore seemed crowded for all two hours, not just with writers but with readers. I chatted with several and, even though I had only published a comic book, GOLD DUST, at the time, it was well received. 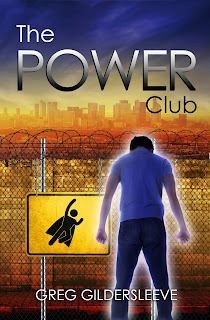 This year, both GOLD DUST and THE POWER CLUB will be available. So come on out and say hello! Good luck, Greg! You're becoming a regular to this event!